please keep Dr. Mero. She is one of the best I have had. 4 staff members at registration area. three were very friendly. She was not rude but was just not enjoying her job that day. She needed to put her happy face! Love Dr. Mero! always a good experience with her. Like the renovation. Front desk area could be more private though. You are able to hear everything about the people checking in next to you! maybe individual stations would be better? You could hear details about phone conversations as well. Doctor's office squeezed me in, so I can't complain about any wait time. Dr. Mero is a top notch provider. She has an excellent bed side manner and answers questions with honesty. her nurses are excellent too! 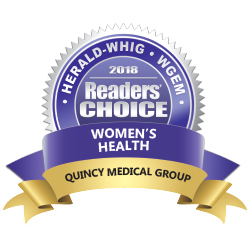 I am always satisfied with my dealings with Quincy Medical Group! Dr. Mero is amazing. she treats you like a friend. When my sister died from breast cancer, she held my hand and cried with me. Right there, she had my deepest respect.